Caisson: an alternative name for a coffer. Lacuna: alternative name for coffered ceilings. The stone and wooden coffers of the Romans are the earliest surviving examples. 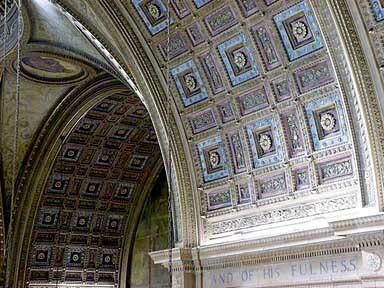 Coffered ceilings were originally created to reduce the weight of stone ceilings, e.g., in the Roman Pantheon. The coffering technique was also used in Ancient Greece. 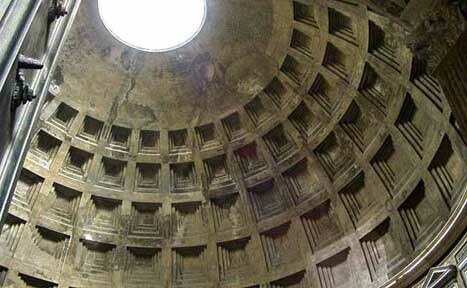 Coffers were most likely first formed out of wooden beams crossing one another in a grid pattern. The technique was brought back during the Renaissance and is commonly seen in Baroque and Neoclassical art and architecture. The strength of the structure is in the framework of the coffers.